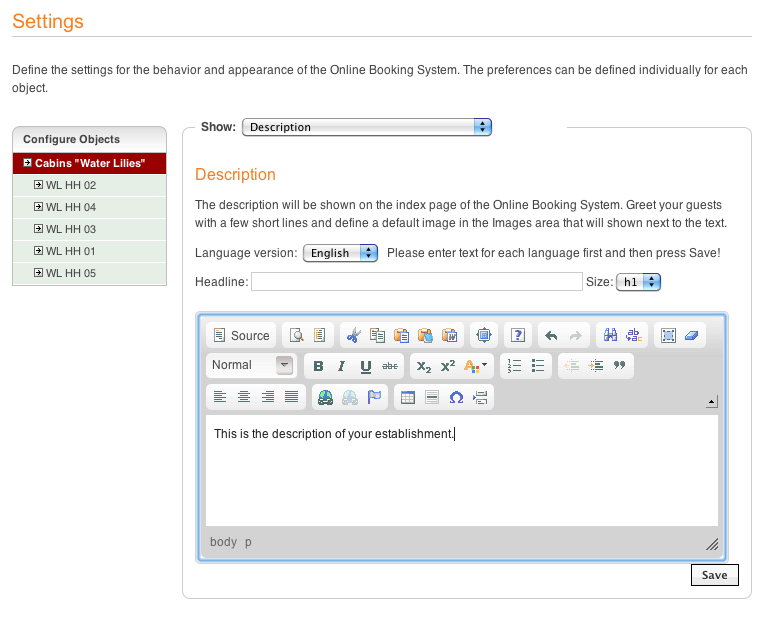 With the Lodgit hotel software, you can receive online bookings directly via your website. Linking the Online Booking System with your website or homepage is done quickly, provided that you have a valid Lodgit Desk license (and installation) and added the module "Online-Systems". Hint: With a personalized demo license, you can try out the Lodgit Online Booking System without any obligation. You just need to synchronize the demo database within Lodgit Desk with the booking engine! Regular synchronization of occupancy data, price information, child discounts, features, etc. Management of images and texts pertaining to individual units and property as well as tailor-made cancellation conditions, terms and conditions, etc. 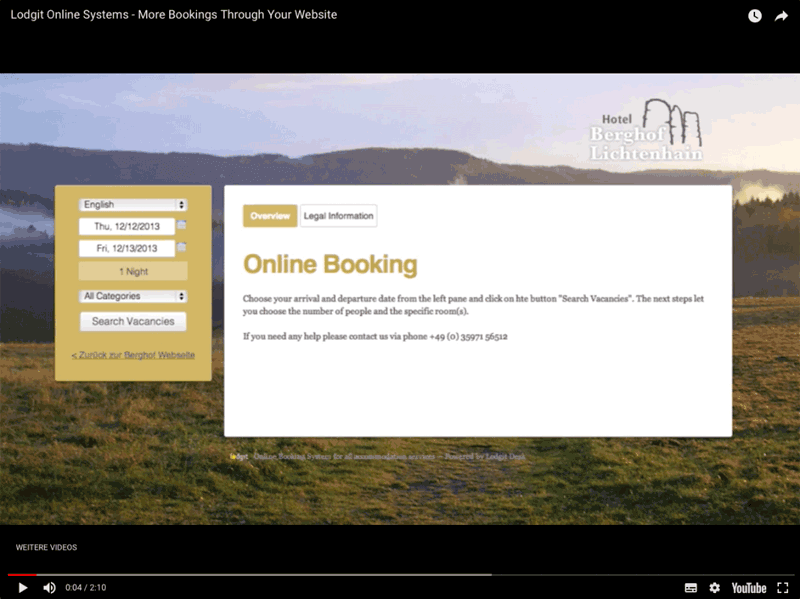 Visitors to your website can use the online booking system to quickly see whether there are any free units in their desired time period and proceed with the binding reservation right away. 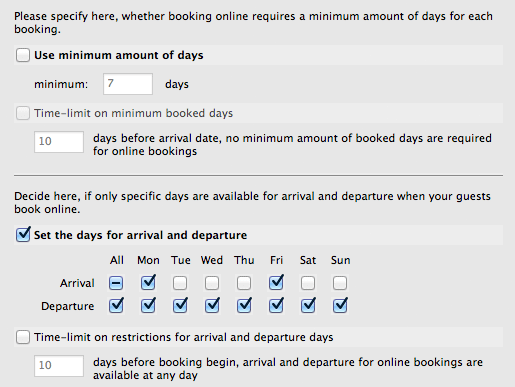 It is also possible to book more than one unit at once (group booking). If the desired time frame offers no more vacancy, the guests can have a look at the overview of reservations in order to see when which units will be free again. As lessor, you alone decide when and which units will be available for online booking. You may set a minimum duration of stay or specific weekdazs for arrivals and departures in the hotel software and confirm every individual online booking which you receive via the online reservation system. Deposits, extras and guests data will all be automatically transferred to your Lodgit Desk setup with the next synchronization, which allows for keeping your processing time to a minimum. Lodgit Online Booking System is part of the additional module "Online-Systems" which can be acquired in our online shop for a monthly fee of just €1.0 per unit that you want to make available online (You don't have to make all units available!). These fees will be calculated based on the time left on your Lodgit Desk license and are to be paid in advance. There are no further commissions or fees. *) PayPal- or Concardis account is necessary for the direct reception of payment. Information about usage fees of those accounts can be viewed at the respective websites.